Hi there! The famous dwarf planet Pluto is better known to us since the flyby of the spacecraft New Horizons in 2015. Today, I tell you about its chemistry. I present you Solid-phase equilibria on Pluto’s surface, by Sugata P. Tan & Jeffrey S. Kargel, which has recently been accepted for publication in The Monthly Notices of the Royal Astronomical Society. I do not want here to recall everything about Pluto. This is a dwarf planet, which has been discovered by Clyde Tombaugh in 1930. It orbits most of the time outside the orbit of Neptune, but with such an eccentricity that it is sometimes inside. It was discovered in 1978 that Pluto has a large satellite, Charon, so large that the system Pluto-Charon can be seen as a binary object. This binary has at least 4 small satellites, which were discovered thanks to the Hubble Space Telescope. Pluto has a tenuous atmosphere. It was discovered from the Earth in 1985 in analyzing a stellar occultation: when a faint, atmosphereless object is aligned between a star and a observer, the observer does not see the star anymore. However, when the object has an atmosphere, the light emitted by the star is deviated, and can even be focused by the atmosphere, resulting in a peak of luminosity. Several occultations have permitted to constrain the atmosphere. It has been calculated that its pressure is about 15 μbar (the one of the Earth being close to 1 bar, so it is very tenuous), and that it endured seasonal variations. By seasonal I mean the same as for the Earth: because of the variations of the Sun-Pluto distance and the obliquity of Pluto, which induces that every surface area has a time-dependent insolation, thermic effects affect the atmosphere. This can be direct effects, i.e. the Sun heats the atmosphere, but also indirect ones, in which the Sun heats the surface, triggering ice sublimation, which itself feeds the atmosphere. The seasonal cycle, i.e. the plutonian (or hadean) year lasts 248 years. Observations have shown that this atmosphere is hotter at its top than at the surface, i.e. the temperature goes down from 110 K to about 45 K (very cold anyway). This atmosphere is mainly composed of nitrogen N2, methane CH4, and carbon monoxide CO.
Cthulhu Regio: a large, dark reddish macula, on which the volatile ice is absent. The reason why I particularly focus on these two regions is that they have two different albedos, i.e. the bright Sputnik Planitia is very efficient to reflect the incident Solar light, while Cthulhu Regio is much less efficient. This also affects the temperature: on Sputnik Planitia, the temperature never rises above 37 K, while it never goes below 42.5 K in Cthulhu Regio. We will see below that it affects the composition of the surface. The three main components, i.e. nitrogen, methane, and carbon monoxide, have different sublimation temperatures at 11μbar, which are 36.9 K, 53 K, and 40.8 K, respectively (sublimation: direct transition from the solid to the gaseous state. No liquid phase.). A mixture of them will then be a coexistence of solid and gaseous phases, which depends on the temperature, the pressure, and the respective abundances of these 3 chemical components. The pressure is set to 11μbar, since it was the pressure measured by New Horizons, but several temperatures should be considered, since it is not homogeneous. The authors considered temperatures between 36.5 K and 41.5 K. Since the atmosphere has seasonal variations, a pressure of 11μbar should be considered as a snapshot at the closest encounter with New Horizons (July 14, 2015), but not as a mean value. The goal of the authors is to build an Equation Of State giving the phases of a given mixture, under conditions of temperature and pressure relevant for Pluto. The surface is thus seen as a multicomponent solid solution. For that, they develop a model, CRYOCHEM for CRYOgenic CHEMistry, which aims at predicting the phase equilibrium under cryogenic conditions. The paper I present you today is part of this development. Any system is supposed to evolve to a minimum of energy, which is an equilibrium, and the composition of the surface of Pluto is assumed to be in thermodynamic equilibrium with the atmosphere. The energy which should be minimized, i.e. the Helmholtz energy, is related to the interactions between the molecules. A hard-sphere model is considered, i.e. a minimal distance between two adjacent particles should be maintained, and for that the geometry of the crystalline structure is considered. Finally, the results are compared with the observations by New Horizons. Such a model requires many parameters. Not only the pressure and temperature, but also the relative fraction of the 3 components, and the parameters related to the energies involved. These parameters are deduced from extrapolations of lab experiments. The predicted coexistence of states predicted by this study is consistent with the observations. Moreover, it shows that the small fraction of carbon monoxide can be neglected, as the behavior of the ternary mixture of N2/CH4/CO is very close to the one of the binary N2/CH4. This results in either a nitrogren-rich solid phase, for the coolest regions (the bright Sputnik Planitia, e.g. ), and a methane-rich solid phase for the warmest ones, like Cthulhu Regio. Developing such a model has broad implications for predicting the composition of bodies’s surfaces, for which we lack of data. The authors give the example of the satellite of Neptune Triton, which size and distance to the Sun present some similarities with Pluto. They also invite the reader to stay tuned, as an application of CRYOCHEM to Titan, which is anyway very different from Pluto, is expected for publication pretty soon. and the one of Jeffrey S. Kargel. Hi there! Today’s article is on the rings of the small planet Chariklo. Their origin is being discussed in Assessment of different formation scenarios for the ring system of (10199) Chariklo, by Mario Melita, René Duffard, Jose-Luis Ortiz and Adriano Campo Bagatin, which has recently been accepted for publication in Astronomy and Astrophysics. Arizona, USA. It orbits about the Sun in 63 years, has an orbital inclination of 23°, and an eccentricity of 0.17, which results in significant variations of its distance to the Sun. Moreover, it orbits close to the 4:3 mean-motion resonance with Uranus, which means that it performs 4 revolutions around the Sun while Uranus performs almost 3. (10199)Chariklo is considered to be possibly a dwarf planet. A dwarf planet is not a planet, since the International Astronomical Union reserved this appellation for only 8 objects, but looks like one. As such, it is large enough to have a pretty spherical shape, with a mean radius of 151 km. It has a pretty fast rotation, with a period of 7 hours. Something unusual to notice: its equatorial section is almost circular (no problem), but its polar axis is the longest one, while it should be the shortest if Chariklo had been shaped by its rotational deformation. Everybody knows the massive rings of Saturn, which can be seen from the Earth with any telescope. These rings are composed of particles, which typical radius ranges from the centimeter to some meters. These particles are mostly water ice, with few contamination by silicates. The spacecrafts Voyager have revealed us the presence of a tiny ring around Jupiter, mainly composed of dust. Moreover, Earth-based observations of Uranus and Neptune revealed rings in 1978 and 1984, respectively. We now know 13 rings for Uranus, which should be composed of submillimetric particles, and 5 rings for Neptune. Interestingly, one of the rings of Neptune, Adams, is composed of 5 arcs, i.e. 5 zones of surdensity, which seem to be pretty stable. It is usually assumed that rings around a planet originate from the disruption of a small body, possibly an impactor. A question is : why do these rings not reaccrete into a new planetary body, which could eventually become a satellite of a planet? Because its orbit is above the Roche limit. The Roche limit is named after the French astronomer and mathematician Édouard Albert Roche who discovered that when a body was too close from a massive object, it could just not survive. This allowed him to say that the distance Mars-Phobos which was originally announced when Phobos was discovered was wrong, and he was right. Imagine a pretty small object orbiting around a massive planet. Since the object has a finite dimension, the gravitational force exerted by the planet has some variation over the volume of the object. More precisely, it decreases with the square of the distance to the planet. If the internal cohesion in the body is smaller than the variations of the gravitational attraction which affect the body, then it just cannot survive, and is tidally disrupted. It was long thought than you need a very massive central object to get rings around. This is why the announcement of the discovery of rings around Chariklo, in 2014, was a shock. The discovery of these rings has been announced in March 2014, and was the consequence of the observation of the occultation by Chariklo of the star UCAC4 248-108672 in June 2013 by 13 instruments, in South America. This was a multichord observation mostly aiming at characterizing a stellar occultation observed from different sites, to infer clues on the shape of the occulting body, and possibly discover a satellite (see this related post). In the case of Chariklo, short occultations before AND after the main one have been measured, which meant a ring system around Chariklo. The following video, made by the European South Observatory, illustrates the light flux drops due to the rings and to Chariklo itself. Actually two rings were discovered, which are now named Oiapoque and Chuí. They have both a radius close to 400 km, Oiapoque being the inner one. These two rings are separated by a gap of about 9 km. Photometric measurements suggest there are essentially composed of water ice. This study investigates and discusses different possible causes for the formation of the rings of Chariklo. It can be shown that, for a satellite which orbits beyond the Roche limit, i.e. which should not be tidally disrupted, the tides induce a secular migration of its orbit: if the satellite orbits faster than the central body (here, Chariklo) rotates around its polar axis, then the satellites migrates inward, i.e. gets closer to the satellite. In that case, it would eventually reach the Roche limit and be disrupted; this is the expected fate of the satellite of Mars Phobos. However, if it orbits above the synchronous orbit, which means that its orbital angular velocity is smaller than the rotation of Chariklo, then it would migrate outward. In the case of Chariklo, the synchronous orbit is closer than the Roche limit. The rotation period of Chariklo is 7 hours, while the rings’ one is 20 hours. As a consequence, tidal inward migration until disruption is impossible. It would have needed Chariklo to have spun much slower in the past, while a faster rotation is to be expected because of the loss of rotational energy over the ages. If the rings are the remnants of a former satellite of Chariklo, then models of formation suggest that this satellite should have had a radius of about 3 km. The total mass of the rings is estimated to be the one of a satellite of 1 km, but only part of the material would have stayed in orbit around Chariklo. The occurence of such an impact is almost precluded by the statistics. We could imagine that the rings are ejectas of an impact on Chariklo. The authors estimate that this impact would have left a crater with a diameter between 20 and 50 km. Once more, the statistics almost preclude it. Imagine an encounter between an unringed Chariklo and another small planet, which itself has a satellite. In that case, favorable conditions could result in the trapping of the satellite in the gravitational field of Chariklo, and its eventual disruption if it is below the Roche limit. The author estimate that it would require the largest body to have a radius of about 6.5 km, and its (former) satellite a radius of 330 meters. The authors favor this scenario, but I do not see how a satellite of a radius of 330 m could generate a ring, which material should correspond to a 1 km-radius body. The quest for rings is not done. Since 2015, another Centaur, (2060)Chiron, is suspected to harbor a system of rings. This could mean that rings are not to be searched around large bodies, as long thought, but in a specific region of the Solar System. Matt Hedman has proposed that the weakness of ice at 70K, which is its temperature in that region of the Solar System, favors the formation and the stability of rings. The profile of Mario Daniel Melita on ResearchGate. The web page of René Duffard. The web page of Jose-Luis Ortiz. The profile of Adriano Campo-Bagatin on ResearchGate. Hi there! Today I will tell you about a recent study accepted for publication in The Monthly Notices of the Royal Astronomical Society. This study, by Rachel A. Smullen and Kaitlin M. Kratter, addresses The fate of debris in the Pluto-Charon system, and has been conducted at Steward Observatory, AZ (USA). Pluto has been discovered by Clyde Tombaugh in 1930 at Lowell Observatory in Flagstaff, Arizona. This was the first discovered object of the Kuiper Belt, and it has been considered as the 9th planet of the Solar System until 2006. Still in Flagstaff, its satellite Charon has been discovered in 1978. Later on, the next arrival of the New Horizons spacecraft motivated observing this system, and thanks to the Hubble Space Telescope, 4 other small moons were discovered: Nix and Hydra in 2005, and Styx and Kerberos in 2012. You can find below images of these 6 bodies taken by New Horizons, and some of their orbital and shape parameters. The pair Pluto-Charon is fascinating from a dynamical point of view, since they represent a case of double synchronous spin-orbit resonance. You know that the Moon is always showing the same face to the Earth, which is due to its synchronous rotation. This means that its orbital period around the Earth is exactly the same as its rotation period, this is a dynamical equilibrium which has been reached after tides had dissipated the rotational energy of the Moon. But the phenomenon goes further for Pluto-Charon, since not only Charon shows the same face to Pluto, but Pluto shows the same face to Charon! This is a consequence of the relative size of the two bodies, each of them being sufficiently large to affect the other one. On the contrary, the small moons have a much more rapid rotation, which is less obvious to explain. The system of Pluto has been visited in 2015 by the spacecraft New Horizons, which gave us invaluable data and the nice images I show you today. The orbit of this system around the Sun is interested as well. Not only it has a significant inclination (17.16° wrt ecliptic), but it is also in a 3:2 mean-motion resonance (MMR) with Neptune. This means that Pluto makes exactly two revolutions around the Sun while Neptune makes three. Moreover, this is a pretty stable dynamical zone. This is probably why Pluto and its satellites are not the only bodies in this zone. Beside the Pluto system, the first Plutino has been discovered in 1993 at the Mauna Kea Observatory, HI. The following figure gives a repartition of the known Trans-Neptunian Objects with respect to their semimajor axis, the Plutinos represent a peak at 39 astronomical units. Distribution of the Kuiper-Belt Objects, plotted from the data of the Minor Planet Center, consulted on January 28th 2017. We see the Plutinos as an accumulation of objects close to 39 AU, which corresponds to the 3:2 MMR with Neptune. The second peak, close to 44 AU, does not correspond to a known resonance. Copyright: The Planetary Mechanics Blog. The last thing I would like to tell you before presenting the study itself is: how to make a debris disk around a pretty massive body? It is thought to come from an impact. An impactor impacts the target, is destroyed into very small parts, which coalesce into rings, before eventually reaccreting and / or being ejected. The most famous debris disk in the Solar System in the system of the Saturnian rings, but there are actually rings about the four giant planets of the Solar System, and the Centaurs (asteroids between the orbits of Jupiter and Neptune) Chariklo and possibly Chiron. It is thought that the Moon is the consequence of such a process, i.e. there has been a debris disk around the Earth. And it is also thought that Charon has been created the same way. This study aims at understanding the fate of the debris disk which has created Charon. Once enough debris accreted to create Charon, or a proto-Charon, debris remained, and have been ejected. There are at least two ways to model a disk: either you consider it as a gas, i.e. some fluid, or you see it as a cloud of many particles, which interact. These interactions are close encounters and collisions, with translate into viscosity if you model the disk as a gas. In this study, the authors chose to model the debris disk as a cloud of particles, which is probably the only way to model the path of ejecta. They made several simulations involved 27060 test particles, over 27.3 kyr, i.e. 1.5 million orbits of Pluto and Charon about their common barycenter. Such a study requires high performance soft- and hardware. Their code was based on the integrator Mercury, which is a commonly used N-body code modeling the motion of N body which interact gravitationally and may collide. The test particles are massless, so they have no gravitational action, but they are under the action of Pluto and its 5 satellites. In some of the tests, a migration of Pluto, which is predicted by models of formation of the Solar System, has also been considered. The hardware is the Super-computer El-Gato (Extremely LarGe Advanced TechnOlogy), based at the University of Arizona, and partly funded by the National Science Foundation. 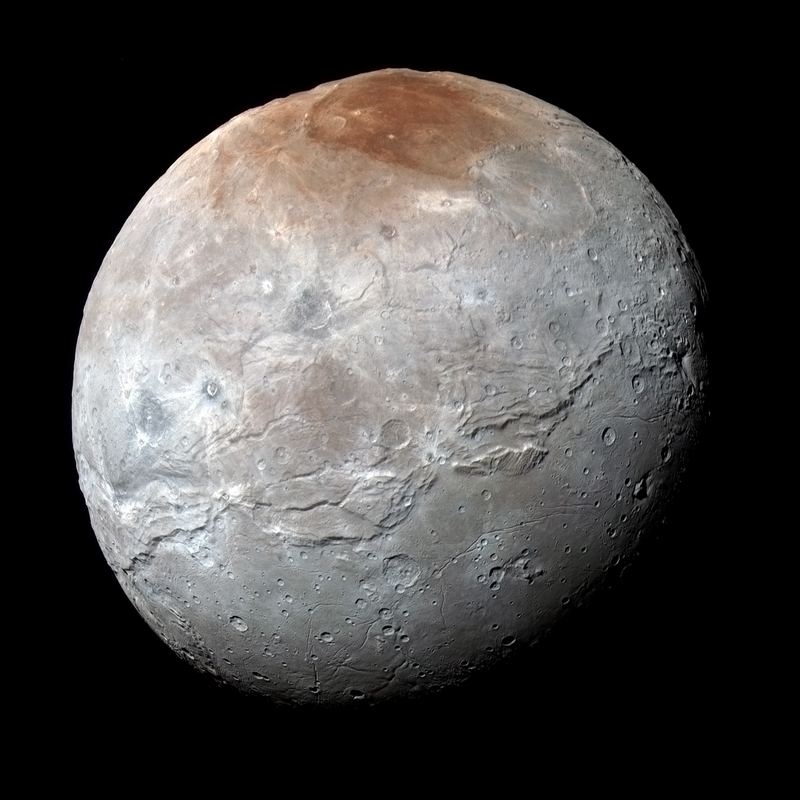 The New Horizons images show that Charon is craterized. In all of their simulations, the authors have collisions between Charon and the debris disk. They show that the impact rate is higher if Charon formed on a wide and eccentric orbit. Moreover, they have fewer impacts if secular migration of Pluto is considered. An issue is: what could be the signature of such an impact now? We know from its synchronous rotation and from the ridges at its surface that Charon has been hot. Hot enough would mean that part of its surface could have been renewed, and then the older impacts would have no signature anymore. Moreover, it would be interesting, but I doubt the information is present in the New Horizons data, to map the impact on the whole surface of Charon. If Charon was synchronous during the most intense episode of impacts, then we would expect a hemispheric repartition of the craters. The simulations show that the most probable destination of the ejected debris is the 3:2 MMR with Neptune. This means that the observed Plutinos could originate from the impact which created Charon. This would mean that the Plutinos are a collisional family, which could be test from their composition. It should be similar to Pluto’s. The simulations do not manage to form the small moons. So, the question of their origin is still open. The webpage of Rachel A. Smullen. The webpage of Kaitlin M. Kratter. The Supercomputer El Gato, which has been intensively used during this study. The Trans-Neptunian Objects (TNOs) on the Minor Planet Center. And that’s it for today! New Horizons is en-route to the asteroid 2014 MU69, which would be the first object visited by a spacecraft which had been launched before its discovery. It should reach it either on December 31th, 2018, or January 1st 2019. Please feel free to comment. You can also subscribe to the RSS feed, and follow me on Twitter.